Like most tea fanatics, I also harbor a teaware obsession. Since space is at a premium in our apartment, I can't let my whims run wild but I do have a cherished collection including handmade and vintage pieces. 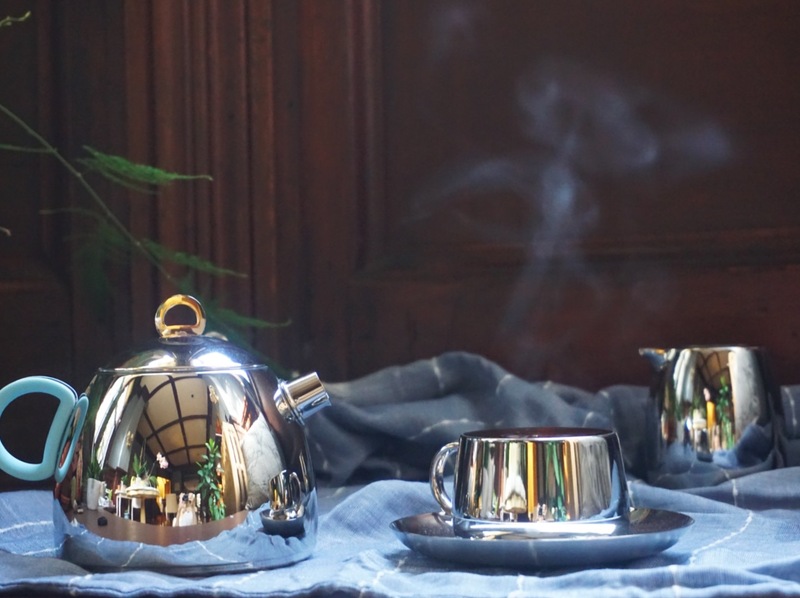 When I was recently asked to review a tea set from Minos, I knew I couldn't refuse. More teaware? Of course. I was pleasantly surprised when the set arrived. 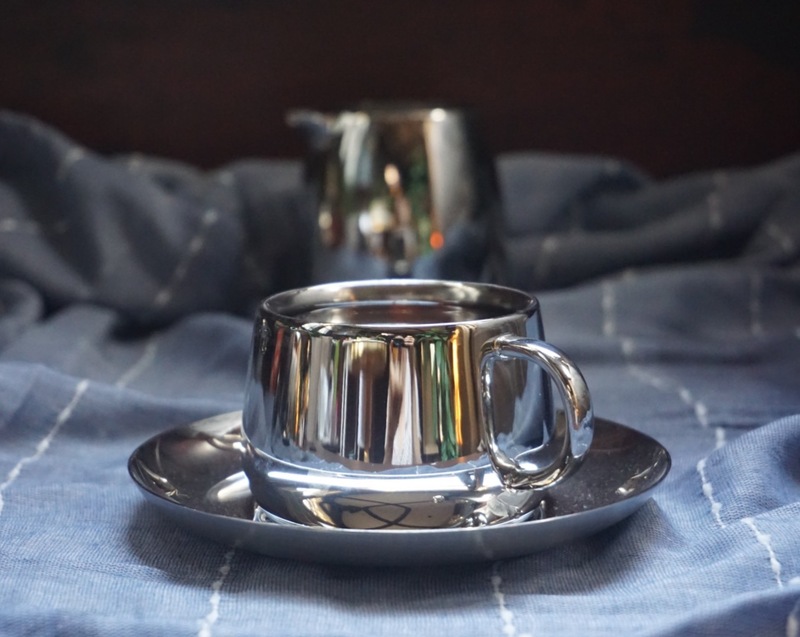 It's a sweet little stainless steel pot with matching cup and saucer, sugar bowl, and creamer. I'm not a stranger to stainless steel pots- I have a large one that we use on the weekend for oversized mugs of tea. This Minos pot is small, about 17 ounces, perfect for tea just for myself. The teapot has a fairly large infuser basket, which makes it great for office use. 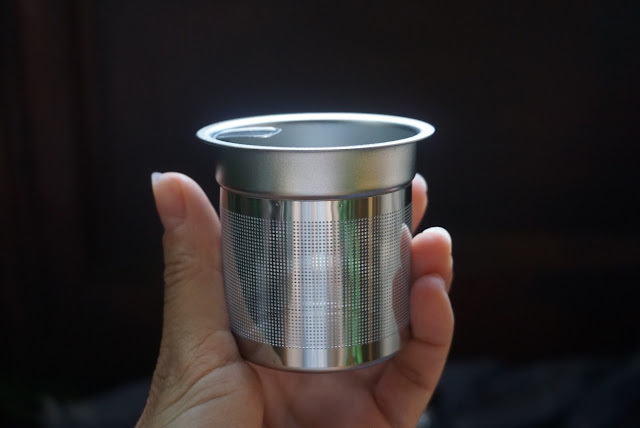 It's easy to remove and is wide enough to let large tea leaves expand. The teapot has a nice pour, very smooth and comfortable. My only critique is that the stainless steel is thin, and gets extremely hot to the touch. Minos provides three silicone rings in festive colors to put over the pot handle, which keeps fingers cool. But don't touch the side of the pot, like I did out of curiosity. Ouch! Since the stainless steel is thin, it retains heat but not quite as long as I really need for the office. I often need to step away from my desk for 30 minutes or so, returning to a lukewarm brew. But honestly, it's not fair to expect a teapot to keep tea hot for that long. The teacup is adorable, and is thicker than the pot so it doesn't burn any fingers. It's a nice size to enjoy a small cup of tea, but I can't use this cup for the early morning. That's when I require my largest mug. As nice as it is to pour little cups of tea, I just want a big mug I can slurp from. However, this is the perfect cup to use for an afternoon tea break. I also like the matching saucer. The matching creamer is attractive and also pours well. I don't often use milk, but it would be nice to put on a table to serve guests. The sugar pot (didn't get a good photo of it, sorry!) is also quite nice, the only issue is that it doesn't come with a small matching spoon. It's not easy to find a tiny spoon to fit inside. I'd love to see a little spoon included, maybe with a matching silicone tip on the handle. But, perhaps that is asking too much. Maybe it's more fun to have a spoon that doesn't match? If you don't mind hunting down your own matching spoon, it is a lovely little sugar pot. Overall, this is a delightful little set that is fun to use. Just be sure to watch your fingers. 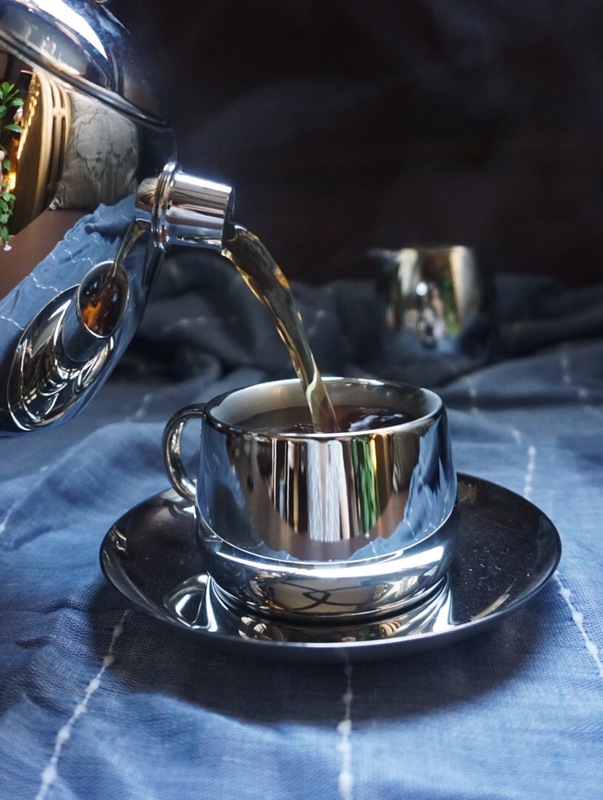 It would be best for teas that use cooler water temps, to make sure you don't run into any unhappy fingertips. A big thank you to Minos for this set! You can learn more about this set here and here. What a nice Minos Living Tea Set it is ! It is an uncommon Tea Set which was not visible to me. I have been very glad to know that it's a sweet very little stainless-steel pot with matching cup and saucer, sugar bowl, and creamer. I want to get this Tea set as soon as possible.